The only app for audio conversion that you need on Mac. Converts to MP3, WAV, FLAC, AIFF and M4A/MP4. Auto or custom audio settings. 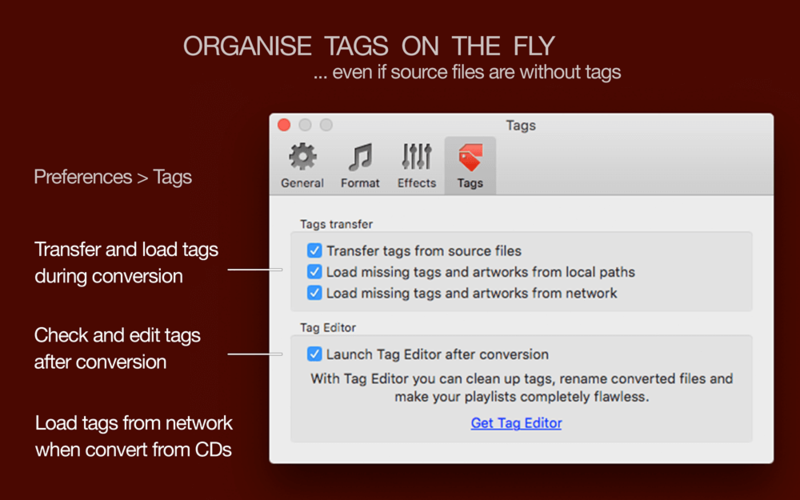 Tag organizing and sound improvement for perfect playback. make tasks of conversion to required audio format simple and fast. Convert 200+ audio and video formats, online multimedia, playlists and Internet shortcuts to quality MP3, WAV, AIFF, FLAC and AAC formats. To Audio Converter can accept unknown file formats for conversion as well - just drop files in! 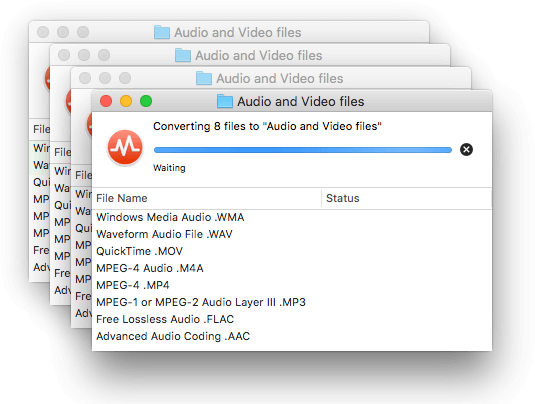 Speed up encoding by dropping the whole media collections in "To Audio Converter." You can import hundreds of gigabytes of a music collection at once and get it back – converted, with preserved directory structure, file names, and tags after a short time. Don't wait when the previous conversion is finished. Drop in the converter as many files and folders as you need and when you need. Add converted files to iTunes playlist straight after conversion. Or create new iTunes playlist with exported files within To Audio Converter interface. To Audio Converter fully utilizes all processor's cores to minimize conversion time. Even gigabytes of media files can be converted in few hours. Default automatic settings allow starting the conversion immediately after installation of To Audio Converter. Just drop files, folders or Internet links in the converter's window or icon to encode in MP3 format with optimal bitrate, sample rate and preserved channels in one click. For more advanced encoding, click on Preferences to fully customize audio format and all aspects of exports. 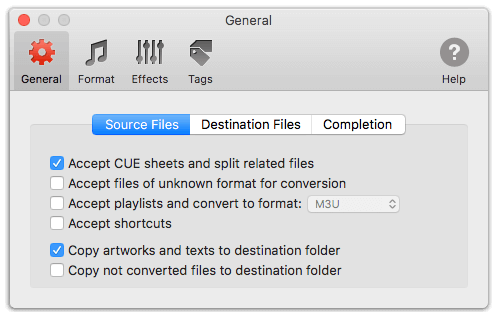 Preserve the structure of original audio collections by enabling "Replicate structure of source folders" option in Preferences / Destination Files. Save converted files exactly where you need them to be. Choose "As Source" folder to keep all version of a track in one place. Or pick another folder or attached to your Mac external device. Drop .CUE file in 'To Audio Converter' to precisely split musical albums and DJ's sets into single tracks. Keep albums' cover art and lyrics by checking "Copy Artwork and texts to destination folder" option. To download missing music metadata and artworks from network databases simultaneously with splitting and conversion, just tick the option in Preferences / Tags. Don't worry about interrupted or failed conversions. To Audio Converter is reliable and crash-free. It means everything that can be converted will be converted! Conversion in the automatic mode preserves the original quality of audio and saves hard drive space. 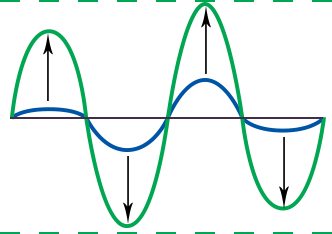 Full customization of Audio Codec, Bit Rate, Channels, Sample Rate and Quality is also possible. 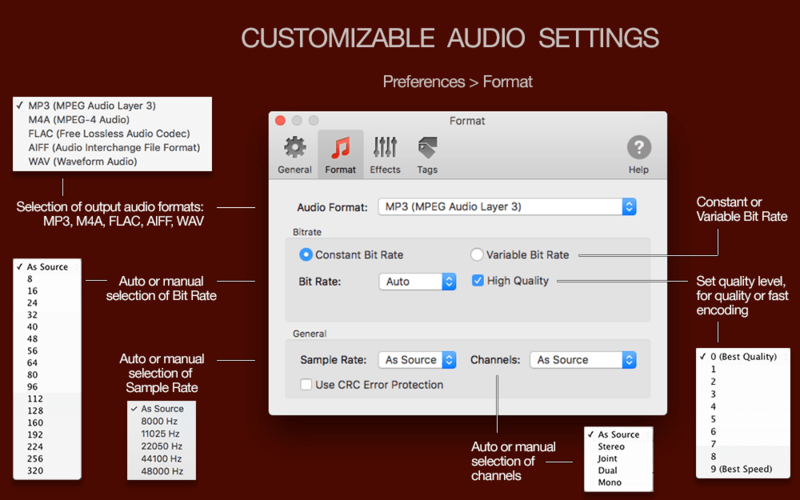 By default, To Audio Converter analyses source audio and calculates the optimal Bitrate and Compression Level. It allows converting between formats without downgrading of audio quality or useless upsampling, with the minimal size of audio files. To retain original audio channels, the converter applies "As Source" setting as well. Rich choice of Audio Codecs, Bit Rate, and Sample Rate ranges, Audio Channel settings for MP3, M4A, WAV, AIFF, FLAC formats allow precisely customize your audio collection for any particular digital player or device. Tip: use the 'Limit Duration' feature in Preferences / Effects to test quickly which format settings give you the best result. Fade-in and Fade-out effects for perfect playback. Brings the loudest peak of a track to the Target Level (usually 0.0 dBFS) and proportionally increases the remaining sound. Enable Automatic Volume Control when converting voice records to make them more clear and hearable. This feature increases the level of too quiet parts of audio automatically. Improve listening experience by smoothing changing of songs. 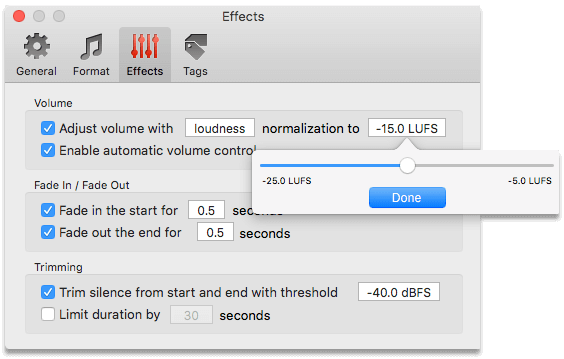 Enable and manage the duration of fade-in and fade-out audio effects in Preferences / Effects. Unify perceived loudness of all tracks in your audio collection or playlist. 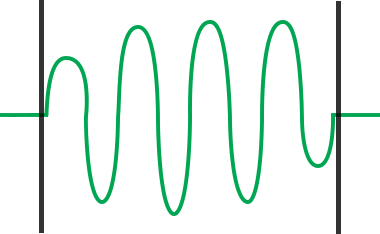 R128 normalization with Target Level of -23.0 LUFS (Loudness Unit Full Scale) is broadcasting loudness standard in the European Union. 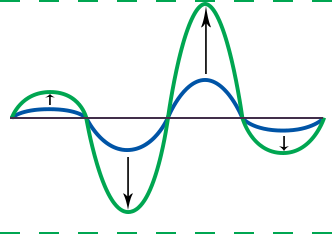 Target Levels, higher than -9.0 LUFS can result in audio compression. We recommend testing the results of such normalization by limiting tracks' duration before relying on it. 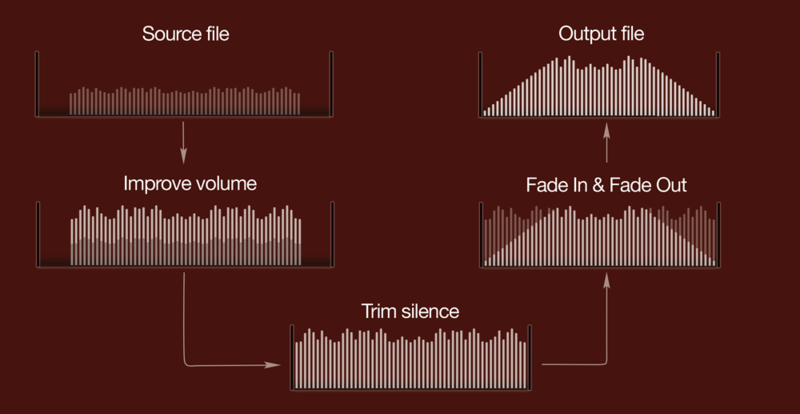 Cut silent seconds at the start and end of tracks along with volume normalization. The Threshold is customizable and can be set between -50 and -15 dBFS. Test results of volume normalization and audio effects for even big audio collection and long records by trimming tracks' to find the best combination of effects preferences. Organize music collection simultaneously with the conversion. retrieve missing tags and artworks from local folders and online services. Get not just one, but ALL audio streams from a video. Many video files contain a few audio streams - such as different language versions, adapted for various types of devices. In such case, To Audio Converter extracts all soundtracks and you can choose which one to listen. * Please, note that To Audio Converter will not convert any DRM-protected files. In all other respects, there are no restrictions. You'll get the most efficient and user-friendly audio converter, which is regularly updated and can solve any problem related to the audio conversion. * If you plan to use the app to convert your favorite playlist and burn it to CD for listening in the car, select 128 or lower Bit Rate since most of the audio car systems do not support higher values.